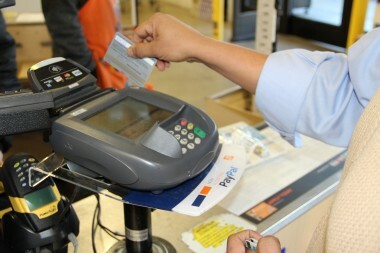 PayPal’s In-Store Payments System Hits Home Depot Stores Across U.S. Following a test phase in which PayPal allowed its employees to purchase items at a handful of Home Depot stores using a PayPal credit card or account number, the eBay-owned payments giant is rolling out the new payments system in 2,000 Home Depot locations across the U.S. The move comes as competing companies and start-ups are aggressively exploring more mobile and in-store payment options. Within the next two weeks, PayPal said in a post on the PayPal Blog, every Home Depot in the U.S. will be equipped to accept payments from customers using a PayPal card or mobile phone number and PIN combination. Yesterday, at Mobile World Congress in Barcelona, PayPal also said it was increasing its efforts in the area of carrier payments, calling for wireless carriers to “revise standards to help optimize user experience, increase flexibility of carrier payments as a payment method, and increase payout rates for merchants.” The statement comes after Boku — which directly competes with PayPal’s recently acquired Zong — introduced a white-label service for in-store payments with wireless feature phones and smartphones, through a partnership with MasterCard. In recent weeks, PayPal’s in-store payments system at Home Depot stores has come under fire from Visa, which is working on its own digital wallet service, called V.me. Visa’s global head of product, Jim McCarthy, said that PayPal’s system poses security risks, and that thieves could potentially see a paying customer’s account number as they enter it in at a payment terminal. PayPal responded by reiterating its commitment to innovating point-of-sale purchasing, and said users’ data is more secure in PayPal’s cloud than it is in their pockets.